Sciency Thoughts: Subfossil Reptile remains from a garbage dump on Yoronjima Island. Subfossil Reptile remains from a garbage dump on Yoronjima Island. Many small tropical and subtropical islands are thought to have impoverished faunas, due to extinctions of local animals caused by human activity, notably habitat modification and the introduction of exotic species. However few such islands possess extensive records of the fauna present prior to the onset of such human activities, making it very hard to assess the nature of their native faunas. In a paper published in the journal Acta Herpetologica in July 2013, Yasuyuki Nakamura of the Tropical Biosphere Research Center at the University of the Ryukyus, Akio Takahashi of the Department of Zoology at Okayama University of Science and Hidetoshi Ota of the Graduate School of Human Scienceand Environment at the University of Hyogo discuss the discovery of a number of Snake and Lizard bones from a garbage dump on Yoronjima Island in the Central Ryukyus. Yoronjima Island is a small, flat island covering 20.5 km2 with a maximum elevation of 97 m, and comprising mostly Pleistocene limestone terraces, located about 30 km to the northeast of Okinawajima Island and 40 km to the southwest of Okinoerabujima Island. It has been occupied sporadically since the Jomon Period (slightly over 2000 years ago), and continuously since at least the early fifteenth century, when a medieval fort was constructed on the island. The island currently retains about 4.94 km2 of native vegetation cover, including forest, shrub, and grassland. The island is currently home to three species of Frogs, four species of Lizards and two species of Snakes; Hallowell’s Tree Frog, Hyla hallowellii, the Ryukyu Kajika Frog, Buergeria japonica, the Okinawa Narrow-mouth Toad, Microhyla okinavensis, the Hokou Gecko, Gekko hokouensis, the House Gecko, Hemidactylus frenatus (probably introduced), the Ryukyu Five-lined Skink, Plestiodon marginatus, the Okinawa Green Grass Lizard, Takydromus smaragdinus, the Okinawa Green Snake, Cyclophiops semicarinatus, and the Brahminy Blind Snake, Ramphotyphlops braminus (also probably introduced). 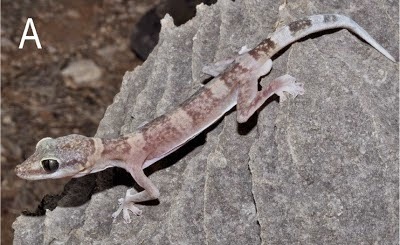 Four other Reptile species have been historically reported from the islands, the Okinawa Keelback Snake, Amphies mapryeri, the Ryukyu Odd-tooth Snake, Dinodon semicarinatum, the Okinawan Tree Lizard, Japalura polygonata polygonata, and the Common Four-clawed Gecko, Gehyra mutilata, however these reports have never been confirmed, and their reliability is uncertain. However a recent study found the remains of the Rhacophorid Tree Frog, Rhacophorus viridis, which is not currently found on the island, at a garbage dump in central Yoronjima, suggesting that local extinctions of small animals have occurred here. The island is also home to the Ryukyu Flying Fox, Pteropus dasymallus, and Watase’s Shrew, Crocidura watasei, which are thought to be indigenous to the island, and the Musk Shrew, Suncus murinus, Norway Rat, Rattus norvegicus, Black Rat, Rattus rattus, House Mouse, Mus musculus, and Japanese Weasel, Mustela itatsi, all of which are known to have been introduced. The Oriental Free-tailed Bat, Tadarida insignis, has also been reported on the island, though the status of this is unclear. The study site is an abandoned garbage dump in the central part of the island. This has not been precisely dated, but from the nature of the Human refuse at the site is thought to have been in use from the late nineteenth century to the mid twentieth century. Most of the species recorded here are thought to be too small to have been targeted for Human consumption, suggesting that they were living on the site, probably consuming small arthropods drawn to the refuse. The specimens were obtained by sieving fine sands from the site, and are therefore all disarticulated. The first species documented from the site is the Okinawa Green Snake, Cyclophiops semicarinatus. This is represented by 24 vertebrae, from the middle and posterior trunk sections of the spine, which appear to come from at least two individuals on the basis of their size. This species is widespread in the Central Ryukyus and is known to still be found on the island. Trunk vertebra of snake Cyclophiops semicarinatus. Left to right: (top) anterior, lateral (left), posterior, (bottom) dorsal, and ventral views. Abbreviations are: con, condyle; cot, cotyle; di, diapophysis; ezs, epizygapophyseal spine; hk, hemal keel; na, neural arch; nc, neural canal; ns, neural spine; pa, parapophysisprz, prezygapophyseal accessory process; przf, prezygapophysealarticular facet; pozf, postzygapophysealarticular facet; sr, subcentral ridge; zy, zygosphene; zyf, zygosphenalarticular facet. Scale bar equals 1 mm. Nakamura et al. (2013). The second species recorded is the Ryukyu Odd-tooth Snake, Dinodon semicarinatum. 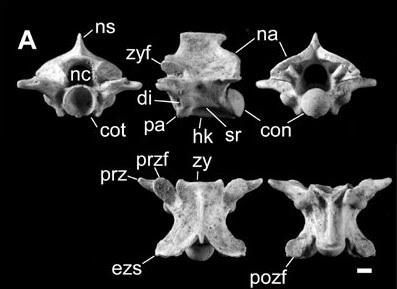 This species is represented by 21 vertebrae from the middle and posterior trunk parts of the spine thought to be from at least two individuals, a juvenile and an adult. This species has previously been reported from the island, but the reliability of these reports has been unclear until now. Vertebra of Dinodon semicarinatum. Left to right: (top) anterior, lateral (left), posterior, (bottom) dorsal, and ventral views. Abbreviation: zygaf, zygantralarticular facet. Scale bar equals 1 mm. Nakamura et al. (2013). The third species reported is the Okinawa Keelback Snake, Amphies mapryeri. 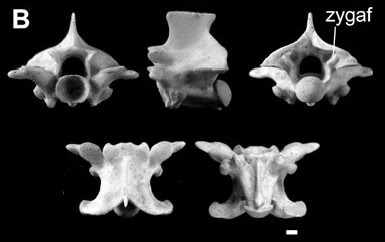 This species is represented by 39 precaudal trunk vertebrae. Like the Ryukyu Odd-tooth Snake, this species has previously been reported from the island, but in the absence of supporting evidence the reliability of these reports has been unverifiable. 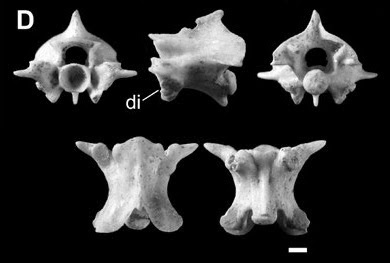 Vertebra of Amphies mapryeri.Left to right: (top) anterior, lateral (left), posterior, (bottom) dorsal, and ventral views. Abbreviations are:hy, hypapophysis; pap, parapophyseal process; Scale bar equals 1 mm. Nakamura et al. (2013). The fourth species reported is an unidentified Sea Snake, Hydrophiinae sp., recorded from a single trunk vertebra. Unlike all the other specimens in the study, this species is highly unlikely to have been living at the study site, and almost certainly got there as a result of Human consumption (Sea Snakes are eaten in the Ryukyus). 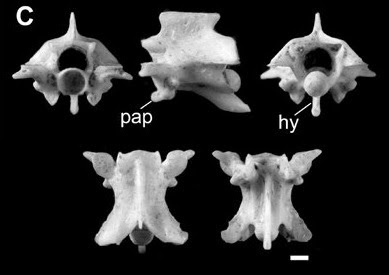 Vertebra of Hydrophiinae sp.. Left to right: (top) anterior, lateral (left), posterior, (bottom) dorsal, and ventral views. Abbreviation: di, diapophysis. Scale bar equals 1 mm. Nakamura et al. (2013). The fifth species identified from the site is the Okinawan Tree Lizard, Japalura polygonata polygonata, identified from six right and four left maxillae, three right and three left dentaries, a proximal part of the right humerus, and a proximal part of the left femur. Like the Ryukyu Odd-tooth Snake and Okinawa Keelback Snake, this species has previously been reported from the island, bt without supporting evidence. 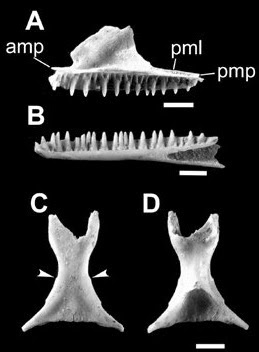 (A) Right maxilla and (B) left dentary of the Okinawan Tree Lizard, Japalura polygonata polygonata, both in median view. Abbreviation: mg, Meckelian groove. Scale bars equal 1 mm. Nakamura et al. (2013). The sixth species reported is the Ryukyu Short-legged Skink, Ateuchosaurus pellopleurus, represented by a single frontal bone (part of the skull). This species has never been reported from Yoronjima Island, though it is found in the Central Ryukyus. Ryukyu Short-legged Skink, Ateuchosaurus pellopleurus, frontal in dorsal view. Abbreviation: pf, parietal foramen. Scale bar equals 1 mm. Nakamura et al. (2013). The seventh species recorded from the site is the Ryukyu Five-lined Skink, Plestiodon marginatus, which is represented by one right dentary, two right and one left posterior mandibles, five right and one left humeri, one right femur, and one right and one left pelvic girdle. This species is still present on the island. 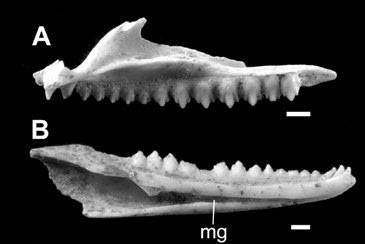 Right dentary of a Ryukyu Five-lined Skink, Plestiodon marginatus, in medial view.Abbreviation: mg, Meckelian groove. Scale bar equals 1 mm. Nakamura et al. (2013). The eighth species recorded is the Okinawa Green Grass Lizard, Takydromuss maragdinus, which is represented by one left dentary and one right and one left pelvic girdle. This species is still present on the island. Left dentary of aOkinawa Green Grass Lizard, Takydromuss maragdinus, in medial view. Abbreviation: mg, Meckelian groove. Scale bar equals 1 mm. Nakamura et al. (2013). The ninth species recorded from the site is the Hokou Gecko, Gekko hokouensis, which is represented by specimens—three right and three left maxillae, two right and three left dentaries and five frontals. This species is still found on the island. 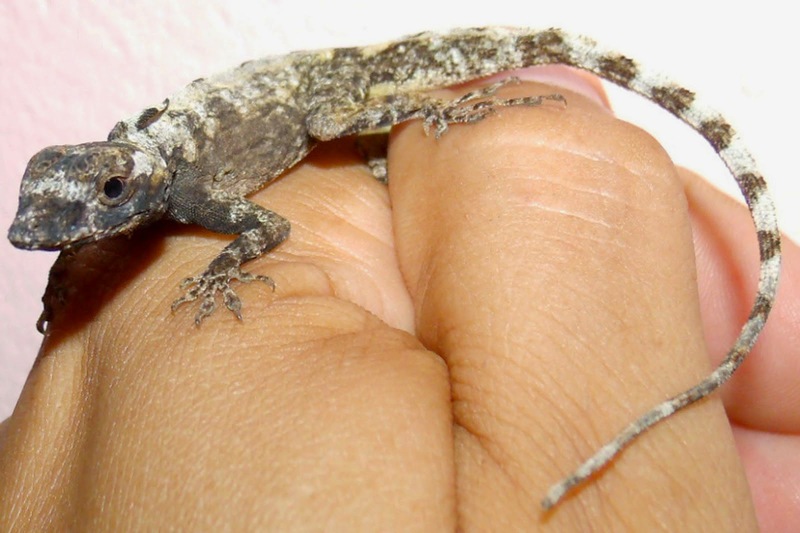 Lizard remains referred to Gekko hokouensis. (A) Right maxilla in medial view, (B) right dentaryin medial view, (C, D) frontal in dorsal (C) and ventral (D) views. Abbreviations are: amp, anteromesial process; pml, posterior maxillary lamina; pmp, posterior maxillary process. Arrows in (C) indicate the posterior extents of the prefrontal sutures. Scale bars equal 1 mm. Nakamura et al. (2013). Next a number of bones belonging to one or more unknown species of large Gekko. These include three right maxillae, two right and one left dentaries, three frontals, and three left pterygoids. Some of these bones appear very similar to those of the Hokou Gecko, but are too large to be assigned to this species. Bones assigned to an unknown Gekko species: (E) right maxilla in medial view, (F) right dentary in medial view, (G, H) frontal in dorsal (G) and ventral (H) views. Abbreviations are: amp, anteromesial process; pml, posterior maxillary lamina; pmp, posterior maxillary process. Arrows in (G) indicate the posterior extents of the prefrontal sutures. Scale bars equal 1 mm. Nakamura et al. (2013). 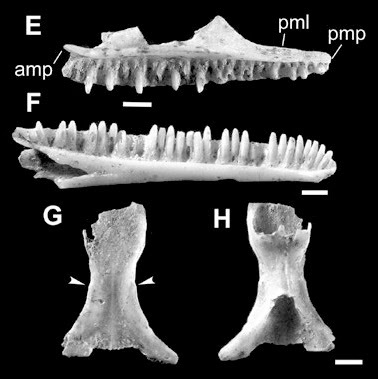 Finally one right and one left maxillae and four right and three left dentaries are assigned to Kuroiwa’s Leopard Gecko, Goniurosaurus kuroiwae, a species not hitherto recorded from the island. Bones assigned to Kuroiwa’s Leopard Gecko, Goniurosaurus kuroiwae: left maxilla in medial view, and (J) right dentaryin medial view. Abbreviation: amp, anteromesial process. Scale bars equal 1 mm. Nakamura et al. (2013). While it is possible that some of these species still remain on Yoronjima Island undiscovered, the nature of the island, small and flat, makes it particularly amenable to biological surveys, making this highly unlikely, strongly suggesting that many species present at the dump have become extinct in recent decades. Many of these species are considered to be forest loving, and the island has lost much of its native forest cover, but several other islands in the Central Ryukyus are known to host more diverse Reptile assemblages with less woodland, making this an unlikely explanation in itself. Instead Nakamura suspect that the decline in Reptile and Amphibian species seen on the island may be linked to the introduction of the Japanese Weasel, Mustela itatsi, in the 1950s in an attempt to control the populations of introduced Rodents. This species has been linked to the demise of other island dwelling Reptiles and Amphibians in the Ryukyu and Izu Islands, where naïve prey species unused to Mammalian predators have quickly succumbed to this aggressive nocturnal predator. A new species of Phasmid Gecko from the Arnhem Plateau in Northern Territory, Australia. cek disini untuk pengeluaran togel hari ini hongkong dan singapura terpercaya. Loan Applications Lend up to $50,000,000.00 and Choose between 1 to 25 years repayment term. We are currently building a system of loan acquisition to help various individuals and organizations with renewal, debt consolidation, refinancing and business setup intentions. Asteroid 2015 CA40 passes the Earth. Three killed by Sumatra landslide. The diet of breeding Grass Owls in Thailand. Asteroid 2014 EK24 passes the Earth. Asteroid 2015 DU passes the Earth. Asteroid 2014 YM9 passes the Earth. Asteroid 2011 WK15 passes the Earth. Snow plow swallowed by sinkhole in New Jersey. Asteroid 2015 CG passes the Earth. Asteroid 2013 CT13 passes the Earth. Asteroid 2015 CH13 passes the Earth. Three new species of Ginger from Laos. Asteroid 2015 BP4 passes the Earth. Asteroid 2015 BM510 passes the Earth. Asteroid 2013 BS45 passes the Earth. Trying to save the Sinkhole Cycad. Asteroid 2015 CM passes the Earth. A new species of Grass Moth from Tibet. Asteroid 2015 CL passes the Earth. A new species of Munronia from Vietnam. Asteroid 2015 BF92 passes the Earth. Asteroid 2009 DT10 passes the Earth. Asteroid 2015 BX509 passes the Earth. Asteroid 2015 BH514 passes the Earth. A new species of Caecilian from Brazil. Asteroid 2013 BZ45 passes the Earth. Natural gas emissions in Boston, Massachusetts. Asteroid 2015 BL passes the Earth. Four new species of Mushroom from Thailand. Asteroid 2008 CQ passes the Earth. Asteroid 2015 BE passes the Earth. Follow up observations of Kepler candidate stars.